Frank Galati won a Tony Award for Best Play and for Best Director for his Broadway production of The Grapes of Wrath and was nominated for an Academy Award for Best Writing for his co-adaptation of the novel, The Accidental Tourist. 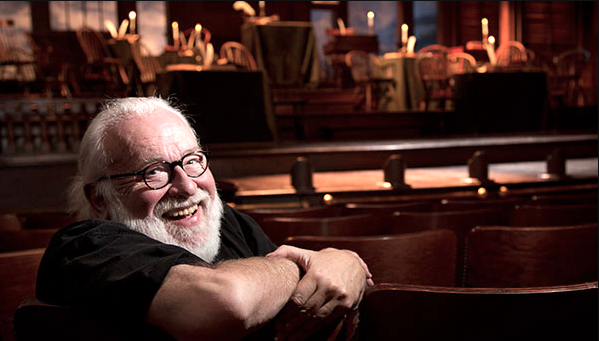 His distinguished career as a director, writer, actor and educator is well known from the Broadway stage to Hollywood, from the Steppenwolf and Goodman Theatres and Northwestern University in Chicago to the Asolo Repertory Theatre in Sarasota. Always thoughtful and generous with his insights about the theatre, art and life, Stay Thirsty Magazine was privileged to visit with him at his winter home in Sarasota for this Conversation about his latest project, an adaptation of Eugène Ionesco’s play, Rhinoceros. 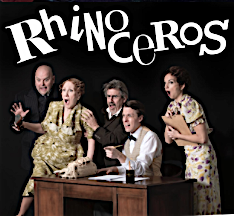 STAY THIRSTY: What was it about Eugène Ionesco’s Rhinoceros that attracted you to spend time adapting and directing it for an Asolo Repertory Theatre production? FRANK GALATI: The theatre is a social institution. It is the place where social vows are renewed and taboos are affirmed. Some of the pleasure of dramatic literature for the spectator is derived from discerning a play's rhetorical strategy and bearing witness to its point of view. As spectators we become involved in the moral problem at the center of the action and the ethical credentials of the protagonist. Naturally since theatre art is “of the moment” theatre artists are drawn to works of dramatic literature that reflect and may resonate with contemporary events and trends. I am drawn to Ionesco's Rhinoceros because, like the sudden silence of a canary in a mineshaft, it is a warning. It sounds an alarm. It signals that the atmosphere has become lethal. STAY THIRSTY: How do you think the play’s satire and themes about mass culture, conformity and integrity will play to a contemporary audience? Will the original European World War II implications communicate well in today’s culture or have you adapted them to resonate in 21st century America? FRANK GALATI: Great art is timeless. In an early one-act from 1955 Ionesco says “ . . . The creative artist himself is the only reliable witness of his times. He discovers them in himself, it is he alone, mysteriously and in perfect freedom, who can express his day and age . . . For me, the theatre is the projection onto the stage of the world within: it is my dreams, my anguish, my dark desires, my inner contradictions that I reserve the right to find the stuff of my plays.” Discovering our “times” within ourselves is the open invitation of all theatre art. I have changed the structure of Rhinoceros some (playing it in two acts instead of three) but I have chosen to set the comedy in the 1930s because that was the period of the author's coming of age. Ionesco remembers: University professors, students, intellectuals were turning Nazi, becoming Iron Guards, one after the other. At the beginning, certainly they were not Nazis. . . one of our friends said: “I don't agree with them, to be sure, but on certain points, nevertheless, I must admit, for example, the Jews . . .” etc. And this was a symptom. mechanism, he accepted everything, he became a rhinoceros. Toward the end, only three or four of us were still resisting. actually is, but how normal it seems to those who yield to it. By using the absurd image of the rhinoceros, Ionesco was trying to shock people into noticing the strangeness of what was actually happening. The rhinoceri are roaming through our neurological savannahs. We now find ourselves very much concerned with something we call ‘post truth,’ and we tend to think that it's scorn of everyday facts and it's construction of alternate realities is something new or postmodern. Yet there is little here that George Orwell did not capture seven decades ago in his notion of ‘doublethink.’ In its philosophy, post-truth restores precisely the fascist attitude to truth – and that is why nothing in our world would startle Eugene Ionesco. I have no doubt that contemporary audiences will hear the arguments in this profoundly strange play as if Ionesco's characters themselves were appearing with Wolf Blitzer in the Situation Room. STAY THIRSTY: Does the term “rhinoceroization” have meaning today? FRANK GALATI: I suppose “rhinocerization” would be a process whereby a human animal is gradually transformed (cell by cell) into a rhinoceros (one of the herd, a lumbering, mud-colored pachyderm.) In our English translation by Derek Prouse the transformation is not so much a process which produces change as it is a contagion which spreads among individuals and finally engulfs all but one of the entire living population. Prouse calls the disease RHINOCERITUS, a moral malignancy, fed by propaganda. The best medicine is truth and the serum is in short supply. STAY THIRSTY: Rhinoceros has an extraordinary history as a play favored to be adapted by other distinguished directors that included Orson Welles, Joseph Anthony and Tom O’Horgan. How and why does your version differ from your predecessors’? How has your cast responded to the idea of this production? Our acting ensemble is charged and ready. The vulnerability of arts organizations in this current toxic environment motivates young theatre artists to work on projects that denounce egoism and human cruelty, re-affirm the highest of human hopes and put compassion, wisdom and skill at the service of social critique. STAY THIRSTY: Does the drama of this play portend coming social, political and economic changes in America? How do you think Ionesco would see it if he were alive today? The mirror Ionesco holds up is a fun-house mirror. The distorted frightened face we see in the glass before us is our own.